I am literally obsessed with this hairstyle and considering I don’t say that too often it’s really saying something! 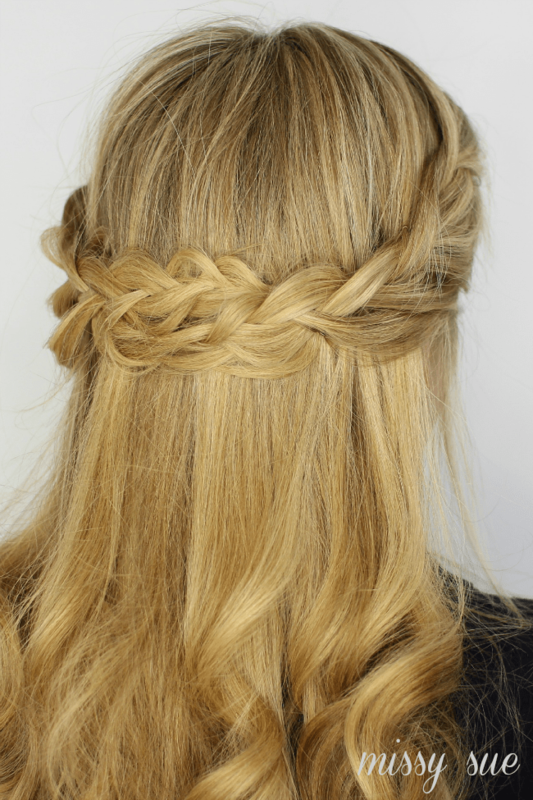 How could you not love this looped half up crown braid? I mean seriously, let’s be serious. 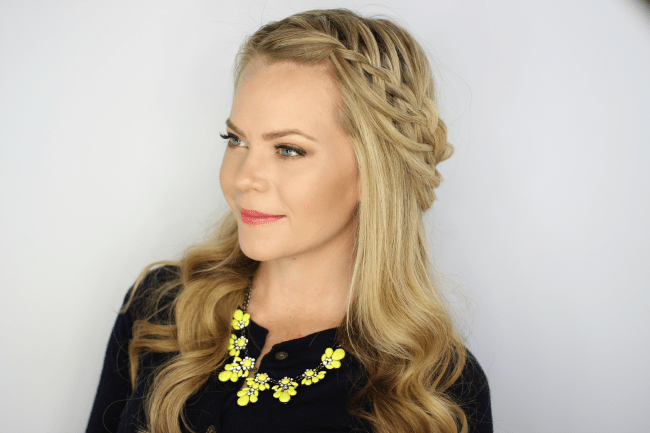 This hairstyle features a few braids in one starting with a lovely waterfall braid with the dropped strands gradually incorporated back into the braid. Then it is carefully wrapped behind the head and secured with a hair pin. Easy enough, right? I loved this hairstyle with only one side braided, see that version here, but thought I’d take it up a notch and throw in a lace braid on the other side. After which I lined them up in the back to create this lovely half up do. I hope you love it and give it a try! If you do, be sure and tag me on instagram so I can see it with the hashtag #mshloopedcrownbraid! Now on to the tutorial! Step 1 / With a part on the right side, separate off a section of hair near the forehead and the part. 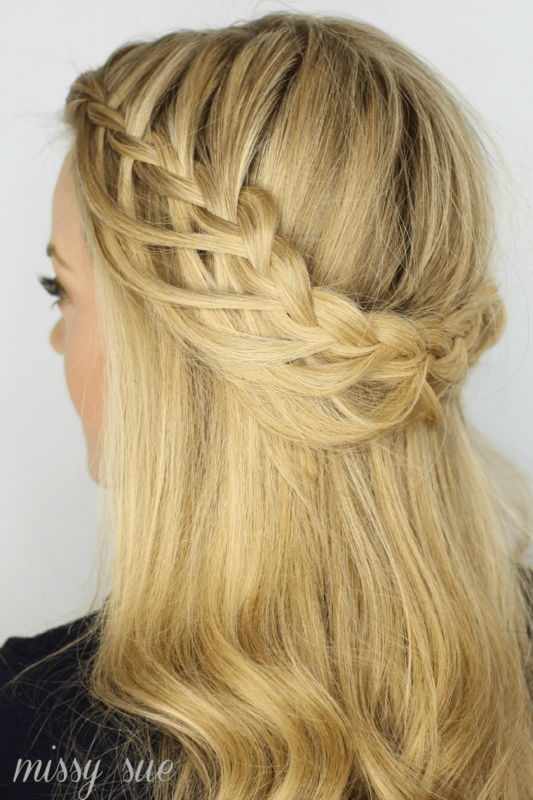 Step 2 / Divide this section into three equal pieces and begin a braid by crossing the side strands over the middle. Step 5 / Repeat steps 3 and 4 until there are four waterfall strands hanging down. Step 6 / Cross the back strand over the middle and bring in hair per usual. Step 7 / Now this time, split the bottom strand, crossing over half the strand, but also pick up the first hanging waterfall strand and incorporate it into the braid as well. Step 9 / Split the bottom strand and cross over one of the halves, then incorporate the second hanging piece into the braid as well. Step 10 / Cross the back strand over the middle but stop bringing in hair so the braid lays smoothly when cross behind the head. Step 11 / Cross the front strand over the middle, without splitting the strand, and bring in the third hanging waterfall piece. Step 12 / Repeat steps 10 and 11 until all the hanging pieces are brought into the braid. Step 13 / Continue braiding the hair down into a regular braid and tie off the end with a clear elastic band. Step 14 / Next, pin the braid out of the way to work with the hair on the other side. Step 15 / Pick up a section of hair on the other side of the part, the right side and divide it into three pieces for the lace braid. Step 16 / Cross the side strands over the middle strand one time. Step 17 / Next, cross the back strand over the middle. Step 18 / Then, cross the front strand over the middle and incorporate a section of hair into the braid. Step 19 / Repeat steps 17 and 18 until the braid reaches the top of the right ear. Step 20 / Continue braiding the hair in a regular braid until it reaches the end. Step 21 / Wrap the braid across the back of the head and pin it in place, hiding the pin underneath the braid on the other side. Step 22 / Let down the first braid, lay it across the lace braid, pulling the tail underneath before pinning it against the head. Step 23 / Finish by pulling some hair loose around the face and a few spritzes of hair spray. I absolutely love it! Too bad my bangs are too short for this atm. Will pin it for later when I’ve grown my hair again. Gorgeous! The highlights show it so well.